Spacetime at large expands but not near me. Though with local expansion I confess. Some wishing as immortals to prevail. As mainstream cosmologists prepare to witness the universe shortly after its birth – when, presumable, its form was markedly different from what we have seen so far in deep space – one wonders if the giant will prove to be immortal after all. Of course, the deeper one peers into a mist the more deceiving what’s seen can be. Or nightmares as it often seems? Which might involve some unknown force? And send it on a one-way trip? he said to those gathered around. and plucked out an answer from there. 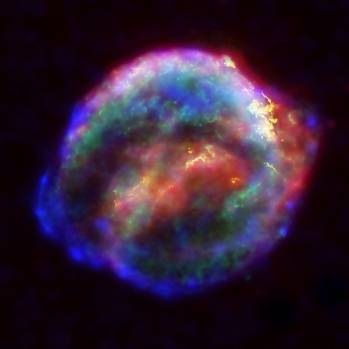 Kepler’s Supernova Remnant, SN 1604, V 843 Ophiuchi, G004.5+06.8 in Visible, X-Ray and Infrared Light. transmitting now a woeful sigh. dimensions folding in the night. and sink back down from whence they came. then it’s not the Whole. or no wholes at best. with our helmets softly touching. There on Earth it’s afternoon. feel our presence on its soil? to man’s efforts that will spoil? dust storms and sand dunes deep. Mom was Commander of the fleet. What Dad did no one knew. was called to Planet X. Apparently aliens who were visiting the Moon to attend a gathering of species committed to a peaceful invasion of Earth were brought into a state of confusion yesterday when a projectile from the planet exploded in a crater not far from the underground center where the meeting was taking place. After the initial shock, and a lot of speculation from reporters, a spokesman for the delegations gave a short reaction. In it was said that they were highly troubled by what appeared to be a wanton act of destruction. Luckily no one had been injured, and although it couldn’t be expected that the Earthlings knew of their presence, the action was condemned as being extremely hostile in showing no regard for possible unforeseen repercussions. An intercepted transmission showing jubilant Earthlings congratulating themselves on what they obviously saw as a successful mission only added to the disgust of the delegates. When the meeting was resumed at a second location, deeper inside the Moon than the first for obvious reasons, there was only one topic on the agenda: “The moon crash and its implications”. It was unanimously decided that the Earthlings must soon be made to realize the responsibilities involved in expanding into space before something far worse occurred. Over how this was to be accomplished there was no immediate agreement, though similar actions would be monitored and if necessary terminated using the clandestine methods already in use for that purpose. The Galactic Council had already come to the decision that this decidedly neurotic race of humans must be brought into line within two of their years. 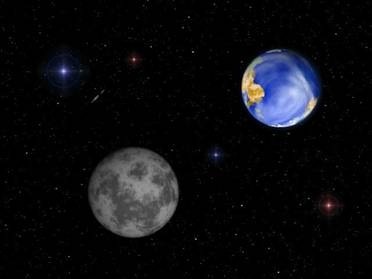 Simulations had already shown that the risk of devastation to Earth’s environment was growing exponentially and that if no action was taken those of the Moon and Mars would follow within fifty years. When the last ship lifted from the Moon’s surface and the guardians closed off the underground chambers, all was peaceful again except for the tremors which could be detected for some time. Another heap of junk is about to collide at high velocity with the Moon to test a theory about ice possibly lying in abundance near its poles. This is important for any humans who are planning to exploit it in the near future, not in the least because they’ll need ice in their cokes when the Sun is high. I hope any sentient creature there will get an inkling of disaster before it gets spread into infinitesimally small, some probably twitching pieces – as cows sense an approaching storm. It is almost certain that microscopic life forms will be sent to their heaven up there, presumably above the none existent sky, perhaps arriving on Earth and eventually replacing us with those of a more enlightened nature. Man has done this before with the Moon: some eastern nation, probably China, did the same thing not long ago, I believe, though I’m not interested enough to look it up. Man feels he has a right to blunder his way into the universe any way he sees fit, using collisions (as above), nosy rovers digging holes everywhere and left-over robots now disintegrating in some toxic atmosphere. Perhaps some earthly microbes that have hitched a ride undetected are even now mutating into exciting new forms. Of course, I should also mention the thousands of pieces of junk flying around our own planet, some still pinging their way in orbit, some dead or dying and heading for the upper atmosphere where they will burn up, perhaps spreading some nasty part of their innards downwards in the process. The astronauts who landed on the moon seem to have been pretty milieu friendly, leaving little else but a lot of footprints and a few leftovers like a stiff US flag and some reflecting mirrors. These will no doubt cause any visiting aliens a few headaches (if they have heads that is) unless man returns first to clean up a bit. Odds are he will return before long and I wonder how much longer it will then be before the landing sights are turned into tourist attractions with exciting new low-gravity experiences? Will there be a Mount Armstrong, a Duke City or perhaps a Mitchell Gorge? Mars has also had its share of unexpected intruders though it has managed to swat quite a few before they could carry out their self centered missions. One made a significant crater of its own on landing due to a mix-up over the system of measurement used by its computer to plot speed and distance, causing the brakes to be applied a little too late. One Russian probe was zapped in the neighborhood of Phobos under mysterious circumstances. The Phobosians probably have a national day to celebrate. The early Viking orbiters took pictures of features on the surface of Mars before flying on to oblivion and beyond. Unfortunately due to lack of detail many geological features took on the form of artificial ones when studied by those not brainwashed by science – a human impediment (not science) which may yet prove useful. Unfortunately, later orbiters with sharper eyes appear to show that these earlier signs of civilization are but optical illusions, though only when a human or an advanced robot can run rampage through the Cydonia region or accidentally comes across a beer can somewhere else, which might in turn might lead to a mysterious entrance into a Martian underground extravaganza, will most be convinced one way or the other. I find it a great pity that these traveling rovers always seem to be put down in the most visually boring locations, so that we laypeople are left with nothing else to do but imagine letters and numbers scrawled on rocks and boulders shaped like familiar objects or gasp with limited excitement at seeing another dust devil spinning by. I do hope we are not alone within the accessible vicinity of space and that others, whoever or whatever they are, are going to teach us a very good lesson before long. And ever more shall be. is plowing through the night. My speed far exceeds that of light. of time back there on Earth. for what it might be worth. one that will share their thirst to know. or down in daydreams sink. to me it’s all the same. Hello! What’s that thing off to port? It’s closing fast it seems. it’s sending out strange beams. “My name is Herby what is yours? for those within my care. is that what this could be? well wait till they hear this. they wouldn’t want to miss. us till it’s had a chew. a plan I can’t embrace. for they have come so far. which only made them sad. the one inside the night. "Seeing is believing." "Except ye see signs and wonders, ye will not believe." I wrote this after reading a fascinating account of the ether theories of Miller and Reich and Leuthold’s work on what he calls Cosmic Energy. The modern idea of the Zero Point Energy might be construed as their modern counterpart. 3. Zero Point Energy (ZPE) – many articles on the internet. Isn’t this an amazing picture from the Spitzer telescope? I add the official interpretation for your perusal. Of course, that explanation involves a black hole which is still just speculation even though the authorities would have us believe otherwise. I would like to think that at the centre of this and other galaxies is something more wonderful than a mathematical formula can produce. PASADENA, Calif. — NASA’s Spitzer Space Telescope has imaged a wild creature of the dark — a coiled galaxy with an eye-like object at its center. The black hole is huge, about 100 million times the mass of our sun, and is feeding off gas and dust along with the occasional unlucky star. Our Milky Way’s central black hole is tame by comparison, with a mass of a few million suns. "The fate of this black hole and others like it is an active area of research," said George Helou, deputy director of NASA’s Spitzer Science Center at the California Institute of Technology in Pasadena. "Some theories hold that the black hole might quiet down and eventually enter a more dormant state like our Milky Way black hole." The ring around the black hole is bursting with new star formation. An inflow of material toward the central bar of the galaxy is causing the ring to light up with new stars. "The ring itself is a fascinating object worthy of study because it is forming stars at a very high rate," said Kartik Sheth, an astronomer at NASA’s Spitzer Science Center. Sheth and Helou are part of a team that made the observations. 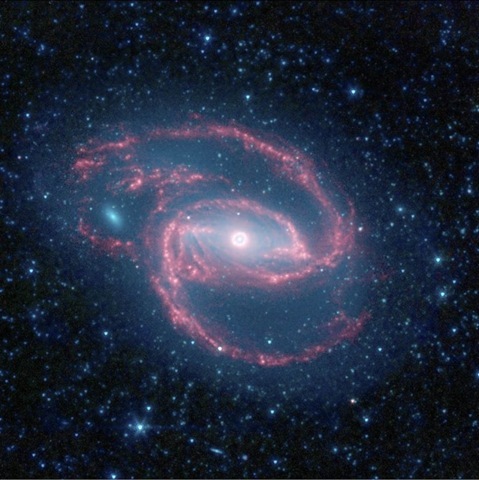 In the Spitzer image, infrared light with shorter wavelengths is blue, while longer-wavelength light is red. The galaxy’s red spiral arms and the swirling spokes seen between the arms show dust heated by newborn stars. Older populations of stars scattered through the galaxy are blue. The fuzzy blue dot to the left, which appears to fit snuggly between the arms, is a companion galaxy. "The companion galaxy that looks as if it’s playing peek-a-boo through the larger galaxy could have plunged through, poking a hole," said Helou. "But we don’t know this for sure. It could also just happen to be aligned with a gap in the arms." Other dots in the picture are either nearby stars in our galaxy, or distant galaxies.